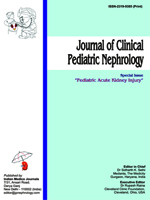 Background: Children hospitalized for cystic fibrosis related pulmonary exacerbation are at risk of acute kidney injury (AKI); yet the incidence of AKI using contemporary definitions has yet to be investigated. Methods: A retrospective chart review was performed for two eras of about 2 years each. During the former era serum creatinine (SCr) was measured as per clinician. In the latter era, a standardized heightened surveillance program was implemented. Using the 2012 KDIGO AKI definition, we compared the incidence, severity of AKI, hospital costs and length of hospital stay between the two eras. Results: AKI was more common after surveillance implementation (23.8% vs. 15.2%; p < .001).The number of SCr measurements per each admission was increased in the surveillance era (3.4 ± 5.4 vs. 2.1 ± 2.1; p < .001). Cost and length of stay were highest in those with AKI in the heightened surveillance era (p<0.001). Conclusions: We found that approximately one-quarter of hospitalized patients with CF will develop AKI. Those with AKI have higher hospital costs and length of stay. Prospective studies to better understand surveillance practices, risk factors, outcomes and strategies to decrease the incidence of AKI are greatly needed. Acute Renal Failure, Aminoglycoside, Nephrotoxicity, Cost, Incidence, Epidemiology.